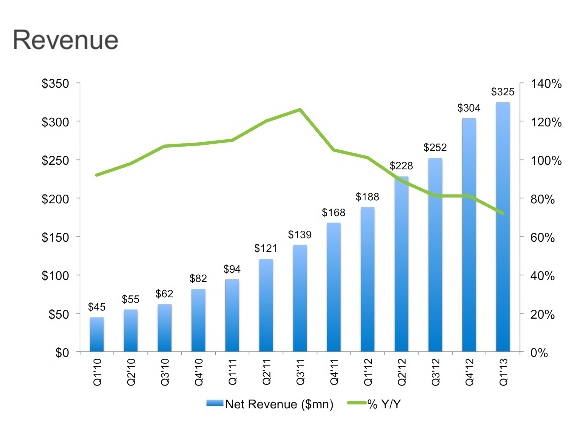 LinkedIn has just reported Q1 earnings of $324.7 million, up 72% year-on-year, and non-GAAP earnings per share of $0.45, both soundly beating analysts’ estimates (via First Call) of $317 million and EPS of $0.31; as well as LinkedIn’s own guidance from last quarter, when it said it expected between $305 million and $310 million in revenues. Net income for Q1 was $22.6 million a big rise on the $5.0 million in earnings last year. Nevertheless, shares of the work-focused social network, however, are down nearly 11% in after-hours trading on news that next quarter won’t be quite as rosy. The company says it now has 225 million users, up from 200 million last quarter. Judging by some of the product launches in the last few weeks it may have been that LinkedIn is laying the groundwork for how it will better monetize the users it has longer term as other revenue streams and customer acquisition decelerate. The new launches have included upgraded, more media-enhanced profiles; a Contacts update to add in more “personal assistant” life organizing features; new iPhone and Android apps; an expanded search engine; @mentions in status updates; Klout-style endorsements; and a Recruiter homepage redesign for the site’s most dedicated user vertical. Talent Solutions revenue was $184.3 million, up 80% over last year. Talent Solutions revenue was 57% of total revenue in the first quarter of 2013, versus 54% last year. Marketing Solutions revenue was $74.8 million, up 56% compared to the first quarter of 2012. Marketing Solutions revenue declined by 2 percentage points to make up 23% of total revenue in the first quarter of 2013. Premium Subscriptions products revenue was $65.6 million, up 73% compared to the first quarter of 2012. It remained level at 20% of total revenue for Q1. The U.S. remains the biggest market for the company, with $201.4 million in revenue, 62% of the total. That’s the same proportion as the previous quarter, and has generally been declining over the last several years. International markets sales were $123.3 million. LinkedIn continues to have a heavy amount of its sales coming from its “field sales channel”: $184 million compared to $140.7 million online. Field sales, involving actual people, are more costly for LinkedIn and so the company will likely be trying to increase its online sales in quarters ahead to improve earnings as growth slows. We’re just about to listen to the call and will update with details from there.